"Bar Charts Make Market Ups And Downs Come To Life"
ar charts expose repeating patterns which are key to making money with stocks. These patterns will yield clues about the stock's future direction... allowing you to enter the market with the new trend. There are many types of bar chart patterns you could use to trade a stock... but, reversal patterns are the easiest to identify. 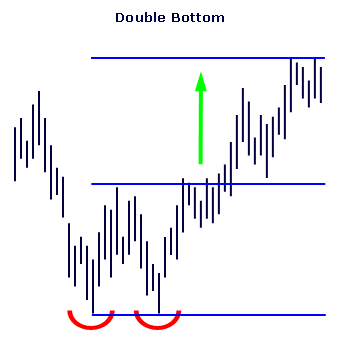 The most common reversal pattern is the Double Bottom. This pattern is characterized by a trough, a peak, and then a final trough. For a valid pattern to exist, there should be at least four weeks between troughs and the peak should advance at least 10 percent from trough to trough. The two lows should be equal... or, very close to it. The pattern is confirmed when the price trades above the peak. You can project a price target by measuring the distance between the trough and peak... then, adding it to the peak. 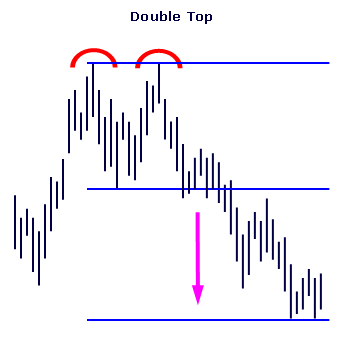 The Double Top is a bearish reversal pattern and follows the same rules as the double bottom... but, in reverse. It is characterized by a peak, a trough, then a final peak. The two highs should be very close in price. The pattern is confirmed when the price falls below the trough. 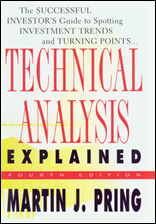 The price target is measured from peak to trough... then, subtracted from the trough. 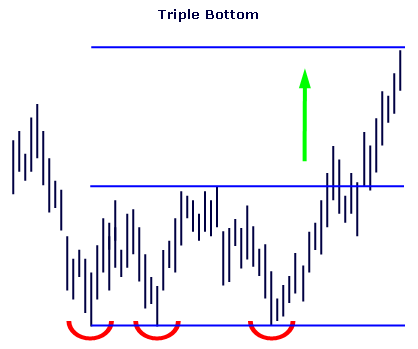 The Triple Bottom is characterized by three equal lows which have developed over an extended period of time... usually, several months. Initially, it will resemble a double bottom that has failed to break-out of a trading range... a trough, peak, trough, peak, trough pattern. When the stock finally does trade above resistance, you can project a price target from the pattern's highest peak. 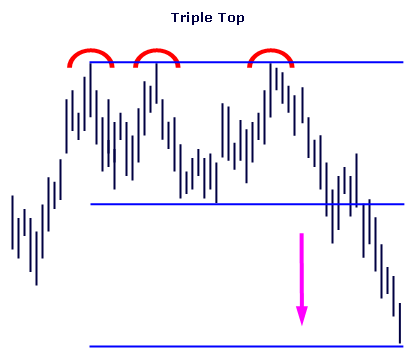 The Triple Top is similar to the triple bottom, but will usually form over a shorter period of time. The three price peaks should be equal, but may vary, slightly. The pattern is confirmed when the stock trades below the two troughs. Another bullish bar chart reversal pattern is the Head and Shoulder Bottom. Also known as the inverse head and shoulder, the pattern looks like a triple bottom. However, the first and last troughs of the pattern are noticeably higher than the middle trough... hence the inverse head and shoulder appearance. 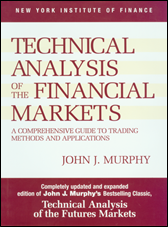 A Neckline is formed by the two peaks of the pattern... and, serves as the origin from which a target price can be projected. The pattern is confirmed once the price breaks-out above the neckline. 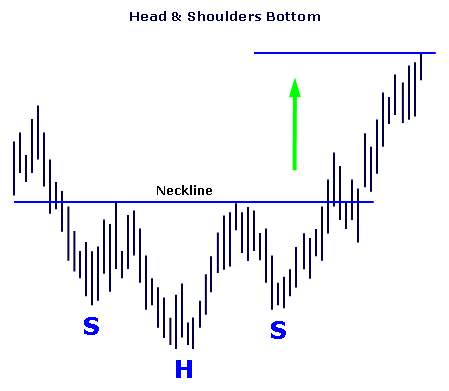 The Head and Shoulder Top is counter to the head and shoulder bottom and is bearish in nature. 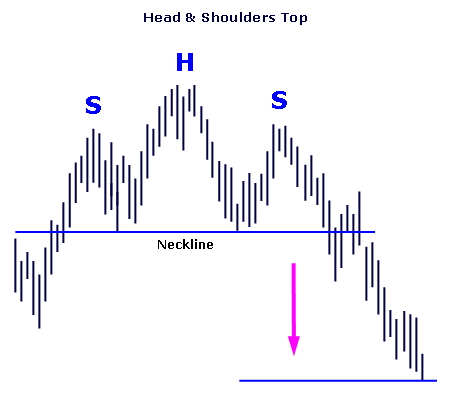 The first and last peaks are lower than the middle peak... forming the head and shoulders. Once the price breaks below the neckline, the pattern is confirmed. Take the distance from the head to the neckline and project it down from the neckline to get a sell-off price target. In addition to bar chart reversal patterns, you'll want to use other technical indicators to confirm these trading opportunities.